We have reasons to believe that your credit card has been involved in a number of fraudulent transactions we have spotted recently. 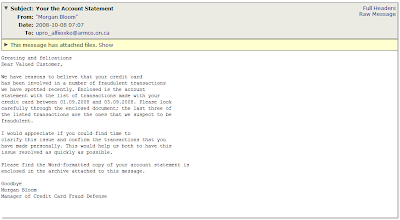 Enclosed is the account statement with the list of transactions made with your credit card between 01.09.2008 and 03.09.2008. Please look carefully through the enclosed document; the last three of the listed transactions are the ones that we suspect to be fraudulent. I would appreciate if you could find time to clarify this issue and confirm the transactions that you have made personally. This would help us both to have this issue resolved as quickly as possible. Please find the Word-formatted copy of your account statement is enclosed in the archive attached to this message.